PARIS! 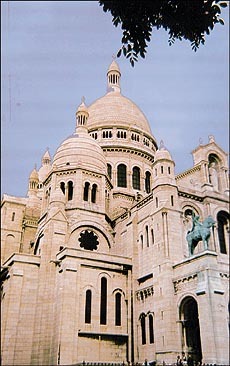 A city synonymous with haute-couture, perfumes, roadside cafes, the Eiffel Tower and romance. Arguably the most beautiful city in the world. During my stay, I got a taste of what life in this bustling metropolis is all about. I can assure you that there is much more to it than just these stereotypes. To celebrate the biggest and arguably the best World Cup ever,the French Government had organised a parallel "World Cup" of French speaking youth between the ages of 16 and 21 in over 120 countries of the world. A selection process consisting of local, regional and national rounds was conducted. The ability to speak fluent French, knowledge of French culture, interest and awareness of football and public speaking skills were put to test. Due to a combination of good luck and a little hard work from my side, I managed to secure the first position in India. Consequently, I was sent to France, along with five other Indians from the same competition, to spend 15 days in Paris as a guest of the French Government. We arrived at the splendid Charles De Gaulle airport at 6.30 in the morning and were driven to our lodgings. It was quite strange to see everybody driving on the right side of the road. The scenery whizzing past seemed to have been taken right out of a Hindi movie song and dance sequence. Paris itself is an interesting blend of old, the not so old and the modern. The old style of architecture has been preserved. Of course, the ever present graffiti dispels all doubts about being in the past. The latest models of cars and awesome racing bikes expedite the journey back to the present. Parisian life, however, fast paced it may look, seems to slow down at the roadside cafes. Paris would not be Paris without these enclaves of tranquillity where one can still see people sitting and chatting unhurriedly about topics as far ranging as football and nuclear disarmament. During the World Cup, cafes were jampacked with fans watching the matches intently and placing friendly bets on their favourite teams. Parisian monuments are exceptionally well preserved. During my stay, apart from the normal sites of tourist importance, I got to see many more which are usually off-limits. For this I must thank the French Foreign Affairs Ministry. The Eiffel Tower is probably the first thing that comes the mind when we think of Paris. It is unique in its appeal. No other structure could perhaps be so drab and yet so awe inspiring. Alexander Gustave Eiffels brainchild has outlived and outshone him. It is hard to believe that if a few people had their way this huge steel structure would have been dismantled and forgotten long ago. Thankfully it survived and today it is still worth climbing all those stairs to the top because the view on getting there is simply fantastic. 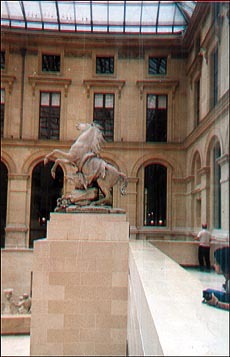 An account of Paris without mentioning its numerous museums would be incomplete. First and foremost, the Louvre. The glass pyramid in front of the museum is very impressive and a modern architectural marvel. There are so many famous works of art under this one roof that its hard keeping track of all them. Our visit was slowly built up and culminated with the Mona Lisa. The famous mysterious smile lived up to its reputation. However, I didnt think that it was the best painting in the whole museum. The Museum of Natural History is also a nice place to visit. It has millions of exhibits, including some of endangered and extinct species. The interesting style of presentation coupled with knowledgeable guides made the visit an interesting one. With places like "Arc de Triomph", "Place de la Concorde" etc. Paris is a sightseers paradise. I never thought that a road could be beautiful until I saw the Champs Elysee. I will never forget the sight of the jam-packed Champs Elysee with cars overflowing with people after the French victory in the finals of the World Cup. Blaring of horns is a form of celebration in French where it is otherwise illegal except in the case of an emergency. While in France we were treated as ambassadors of our respective countries. Quite a few of us, including myself, gave interviews to various TV channels. It was a great maturing experience and very exciting as well. We also took part in a World Youth Debate where the common problems of the world were discussed. I was very proud to have received a chance to represent my country and to put forth constructive ideas at this forum. At formal receptions we were required to wear our national dress. The Indian kurta-pyjama and saris were a big hit with everyone wanting to take photographs with us. In terms of historical importance as well as architectural splendour and opulence the Chateau de Verailles is in a class of its own. On becoming king, Louis XIV set out to build a palace befitting the grandeur of the French empire. The result  Versailles. This huge edifice truly signified his extravagant lifestyle. The beautiful frescoes and plush decors make the palace surreal in its beauty. Particularly impressive is the Hall of Mirrors which fulfils its purpose to this day. To impress visitors and to apprise them of the splendour of Louis XIV, we spent a whole day in Versailles. The gardens of the chateau are spread over a large area. The soothing music being played enhances their beauty. The trees are shaped to look like continuous walls lining the avenues. There is also a canal which brings water for the many fountains. The whole afternoon was spent playing football and just lazing around along side the canal. At night we received an unexpected treat in the form of a sound and light show, complete with fireworks, about the history of Versailles. The show is conducted about eight times a year. Images relating to the history of Versailles are projected on fan-shaped fountains while the narrator takes you back in time. Despite the extreme cold the show made it an evening well spent. Paris is a wonderful place to visit and to spend time in. However, it can be frightfully expensive especially after conversion. The image of the French being snooty and unhelpful probably arises from the reluctance to speak English. I found from personal experience that if you speak or even try to speak their language, the French suddenly become very warm and helpful. But then its probably the same all over the world. The metro is by far the best way to travel in Paris. It is both cheap and convenient. There are a few things that the French are very particular about. They attach a lot of importance to being polite and chivalrous to everybody. One must prepared to use S il vous plait, Merci and Pardon very liberally indeed. And yes, smiling will do you no harm. It costs you nothing and makes you look more pleasant and cheerful. Of course, the rewards in terms of people being more friendly and welcoming make it all the more worthwhile. Another thing to remember is that if you go to the Champs Elysee or other famous shopping centres frequented by tourists, you are not likely to get the bargains you may be looking for. Even during the biannual sales, prices are still sky-high. 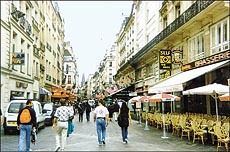 The real bargains can be found in the outskirts of Paris in the African or Asian localities like Barbes. However, these can be dangerous to venture into alone. While in France, I had the chance to interact with youngsters of my age from all over the world. Talking to them, exchanging ideas and discussing the problems each one of us faces, I realised that we are much the same people. (Boys all over the world have girl problems). Colour, creed and language are just barriers we impose on ourselves. Disregarding these, we are one people. Citizens of the world! And today I can say with full certainty that while I went to France as a citizen of India, I came back as a proud Indian citizen of the world.